Amla is known for Vitamin C and this drink is best suited for all ages. Amla builds immunity, palm crystal is useful in throat problems and lowering cholestrol and jeera is best for digestion. Needless to say, honey is an energy booster with antioxidants. I had some amlas and tried this. Grate amlas. Crush palm crystals. Heat a kadai and dry roast cumin seeds till brown. Add 4 cups of water and allow it to boil till it reduces to half. Add the grated amlas and palm crystals, boil it for a minute, switch off the stove and cover it with a lid for 10 minutes. Grind and strain it through a strainer, add honey, stir and drink. Wow thats wonderfcombo of healthy drink.. I am really missing the amla here.. I have bookmarked it. Thanks maami!!!! Nice refeshing and a healthy drink with good combos. Looks like very refreshing drink.But what is Palm crystal? It is a crystalised sugar made out of palm. Such a cool drink! Very refreshing! Interesting health drink but I don't think we can get these ingredients in the Uk. Yes, this is the best season one can get amlas in India. I miss it so much. Very refreshing drink. Thanks Mrs. Shanti for the lime pickle suggestion. Such a healthy drink..looks fantastic..
so healthy n simple drink! Your blog is so beautiful dear. Thanks for your comment on my blog. It helped me to discover ur blog too:) m gonna follow u..Happy blogging. new kind of drink.. healthy too. good one. so healthy and tasty drink. Supera irukku ...especially for Indian summers. Would love to have a drink now..
A wonder drink this should help ppl who suffer from heat strokes and naturally heat body!!! My kinda drink in few words!!! Lovely and simple drink to make. Nellikai is good for health too, great for the summer. 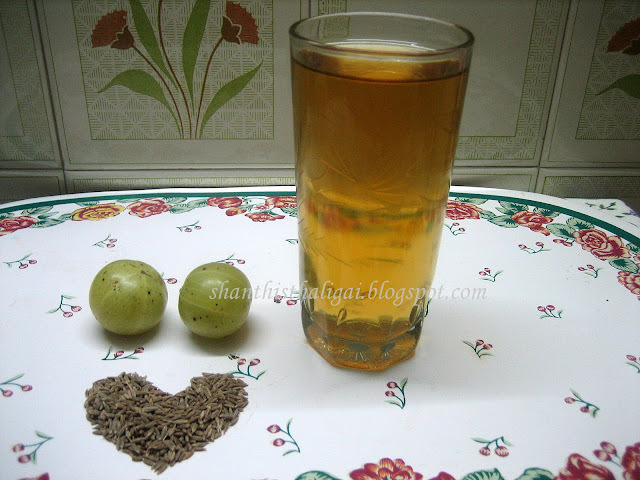 thank you very much for visiting my blog..i've found you now and following you fot these lovely dishes and posts..Amla drink looks refreshing..we get amla in U.K, not sure about palm crystal..any particular shop can i visit to get? Nice combo and a healthy drink.